I’ve spent most of my life in north Texas. Anyone who lives here knows what to expect each spring and early summer: a rash of severe thunderstorms and the possibility of tornadoes. We like to think the chances are small that our small piece of the world could be hit by a tornado, and so far we’ve been pretty lucky. We watch the news and shake our heads at the devastation other places have incurred at the hands of extreme weather, but we all know it could just as well happen here. Today Mother Nature reminded us who’s in control. Michael mentioned when he let the dogs out this morning how incredibly humid it was outside. I checked the weather on the computer and was surprised to see thunderstorms to the west of Ft Worth. I had already planned on going downtown to the Farmer’s Market, so I knew I needed to get a move on in order to beat the possibility of bad weather. As I drove the three miles or so to the market, I took note of the extreme humidity in the air. It was so thick it almost looked like fog settling over the downtown skyscrapers. Again, I’ve seen a lot of Texas sky through the years, and the thought immediately crossed my mind: This looks like tornado weather. It’s unmistakable, even if it takes many forms. There’s always a different feel in the air, an eerie stillness, and a muggy stickiness that makes you want to take a shower. Sometimes there’s a dark, low lying cloud that looks as if a tornado could drop down at any moment. Sometimes the sky takes on a strange greenish tint. Sometimes it’s windy, a lot of times there’s no wind at all. Sometimes it’s raining so hard you aren’t aware there’s a tornado nearby. Sometimes you can stand beneath the clouds and watch them rotate in a circle above your head. Whatever form it takes, tornado weather is no fun. It started to sprinkle on my way back from Farmer’s Market, and the streets were wet when I went out to my car from the grocery store I stopped of at on the way home. As I made something for lunch, my heart stopped. The tornado sirens were going off. I turned on the TV and looked out the window. Our house is located between two fire stations, each of them less than half a mile away. When the tornado sirens go off, we always hear them. And they always scare me. Once when I was a kid, my little sister and I decided to walk up to the grocery store about a half mile from our house. We noticed how dark the skies were getting as we walked, and by the time we got to the store it started raining like crazy. We were glad we had made it in time–but then the tornado sirens went off. We were just kids, and had no idea what we should do. I was so scared. Luckily, a neighbor was also in the store and gave us a ride home. My mom was frantic by the time we returned, and that experience left a mark of fear that I always remember when I hear the sound of tornado sirens. 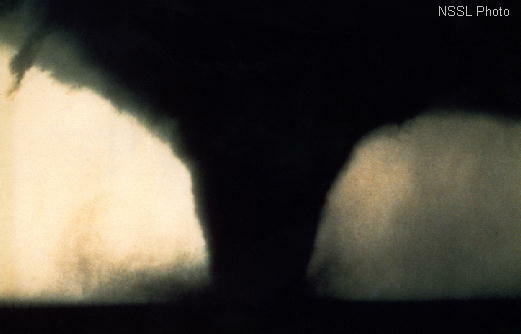 In 1979, when I was a teenager waiting tables close to Love Field Airport, a huge storm hit Dallas. The sky had that strange, greenish tint and the clouds were rotating. At one point it was raining so hard and the wind blowing so strongly, it sounded like a train rumbling through. At the time I had no idea that’s what a tornado sounds like, and we learned later than several tornadoes had indeed touched down in our area. Driving home on the freeway that night, it looked like a war zone. I passed an 18 wheeler that had a small sports car lodged completely under its trailer. Last year I was at the tail end of a run at the lake, less than three miles from my home, when tornado sirens went off. It was overcast, but not stormy, and I was confused. Tornado sirens? While I was running? I had no idea what I should do, so I kept running. I made it back to my car and drove home to the sound of the sirens–and constantly craned my head to monitor the sky. I knew driving through a tornado was the dumbest thing I could do, but I was also amazed at how dumb everyone else was, too. Everyone seemed oblivious to the danger, and the next day at work we all discussed how we pretty much ignored the sirens, even as we watched live footage of a small tornado twisting through an industrial section just west of downtown. I remembered all those episodes of Storm Chasers I’ve watched, knowing we all should have taken the sirens more seriously. Today I took the sirens seriously. I turned on the TV and watched live footage of a tornado to the south, just outside Lancaster. I knew if it kept going north and hit downtown Dallas, it would be devastating. I watched in amazement as the tornado picked up tractor trailers weighing several tons. They looked like they were made of styrofoam. Huge pieces of debris were spinning around the tornado, and I knew it was doing a lot of damage in a town that had already been hit hard by a tornado in 1994. Tornadoes were also being reported in Arlington, a city situated between Ft Worth and Dallas. Even with the sirens blaring, I kept hearing a chainsaw in the alley and realized someone was working outside who must not know about the danger. I ran out back and told a worker who didn’t speak English, with hand signals and bad Spanish, that a tornado was just to the south. You don’t need much language to understand a tornado. As the day developed, I lost count of how many times the sirens sounded in my neighborhood. I cleared some things off the floor of a closet in the middle of the house, grabbed my large meditation mat and my phone, and coerced the dogs to stay with me. I texted Michael and close friends, telling them to stay safe, and talked to the dogs. I thought about my friends who are teachers, and how difficult it must be at school with all the sirens. Allyson texted a photo of baseball sized hail in her yard. The dogs and I went into the closet six or seven times, until the storms passed and the sirens remained silent. Tonight I watch the news and see the damage. I’m thankful the tornadoes missed my neighborhood, but sad for those coming home tonight to a wrecked home. I’m relieved there doesn’t seem to be any loss of life, and hope all the missing pets will find their way back to their owners. I’ve never seen so many tornadoes so close to home. I’m apprehensive that it’s only April 3 and tornado season seems to already be in full swing. Unofficially, at least 12 tornadoes touched down today, and 300 homes have been destroyed. And despite the fear they induce, I’m most thankful for the tornado sirens. Good lord. 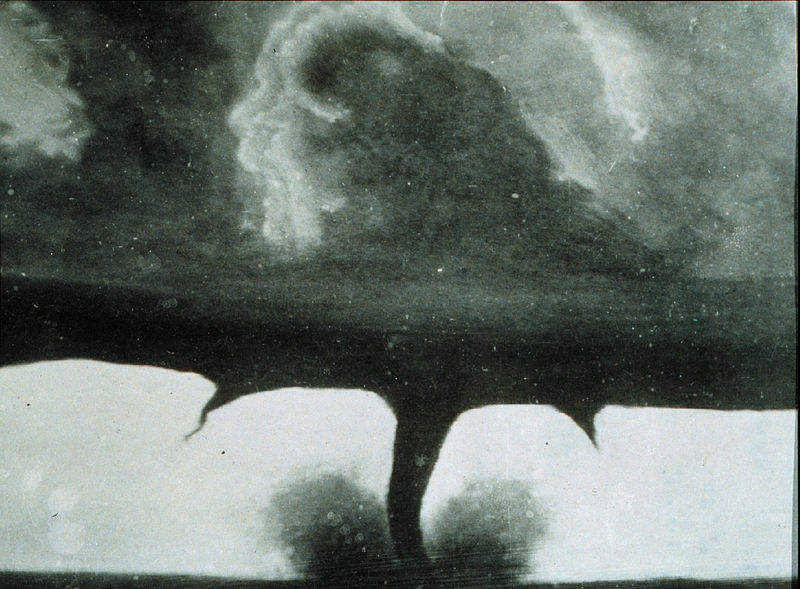 We’ve been writing back and forth about scary things, but tornadoes are in another category altogether. Stay safe! Yes, I think I might even take a grizzly encounter over a tornado. It was a very scary day, but I still have a roof over my head, unlike many people in the Dallas area tonight. Glad you weathered the storm. We had a tornado touch down about a 1/2 mile from our house last spring but we live in a rural area so all the damage was luckily concentrated on power poles, barns and trees. I live in a manufactured home so there is no place in the house that would provide much protection. We just had a storm cellar installed 3 days ago so finally I have a “hidey hole” to go to if the need ever arises again. Stay safe and hope you only hear about tornadoes and don’t have to go through one. I don’t know why more people down here don’t have storm cellars or basements. It’s kind of crazy to live in tornado alley and have to rely on a closet or bathtub to protect you from a tornado. Thanks for your concern! Well, I’m sure sorry you had to go through all that anxious time today, but glad for you that the tornados missed your neighborhood. It’s so terrible to hear about these things, and to know that so many people had their homes destroyed. It is good to hear that no lives were lost – that is the most important thing. It was such a surreal day. I’ve heard many tornado sirens in my life, and seen lots of scary skies, but nothing like what we had on Tuesday. Looking at the damage the next day on the news, it truly is a miracle that no one was killed. kids were little,)they suggested that a person go buy a bike helmet, a good one. Put it on next time, and protect that head! Really, last week’s tornadoes are the worst I’ve ever seen here in Dallas. It was insane. Yesterday I heard on the news that there were 17 confirmed tornadoes in the area. Thankfully, most of them did no damage. I hope we never have anything that bad again. As for the helmet, a man in Keller, where an EF3 touched down, said he put on his high school football helmet. I thought that was a great idea–and I wondered why I had never thought of putting on my bike helmet! Thanks for the reminder.